My Bronze Horseman Purgatory: What's Good for the Goose..
What's Good for the Goose..
...you better believe is BY GOD good for the gander. SPOILER ALERT: Don't read unless you've read 39% of The Summer Garden. YOU GO TATIANA!!! WHOO HOOO!!! I am sitting here reading this argument between Tatiana and Alexander about Jeff's bachelor party...and I am FIRED up. Today is my 18th wedding anniversary and believe me - I have had this conversation before. Or ones just like it. "Oh it's OK that I'm going to a gogo bar where there will be scantily clad women - if they are dressed at all - because I'm not going to be touching any of them." So I'm sitting here reading this and I'm all kinds of juiced up and then WHAM!!! 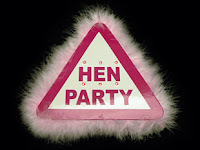 Tania drops the HEN NIGHT BOMB!!! GO effing TATIANA! You get DOWN with your bad self, Girl!!! I am SO HAPPY she just brought this up, I don't know what to DO with myself. And Alexander's feathers immediately ruffled and he said "Military guys go to meet women there" or something like that...and what did I do? I JUMPED UP - ran into the house - and got my computer. I want to savor this moment, much like Shura savored their first copulative encounter together. That's right. Mmmm Hmmmm....S-A-V-O-R! I have been having the HARDEST time with this storyline since the second Alexander interviewed with Bill. He knows it's the right job for him?? How can he be so blind?! These people are money-grubbing, bull-dozing, disrespectful PIGS who have loveless lives and want the same for Alexander!! It is high time Shura QUITS this job and starts his own business building houses. All he'd have to do is sell 20 acres - that are nowhere near his house - and he'd make a mint. She bought the property for $50/acre and now it's worth $5K!!! How awesome is THAT?!? Either that or move. I am just so unhappy with this situation and horrible people, I don't know what to do with myself. Just to backtrack a bit - the last time I blogged, Alexander didn't know about Sam. I am SO happy that is behind them and I LOVE Tom Richter and I LOVE that he married Vikki. And I'm worried about this Saika. I think she's a spy. I think her parents are spies and she is trying to get information out of the Metanovs by misleading Tania into giving it to her. OK that's a stretch - I know - but there is something so off about her. I also think she digs Tania and obvs Tonia will remain clueless about this. Why did Tania grow up that summer? Why are Saika's feet and hands always dirty and her breath always sour? Why can't Shura see through these assholes? OK I may have another question or two but I have GOT to see what unfolds with the party convo in the Barrington trailer - I mean mobile home - this evening. Happy Anniversary!! It's our 18th Anniversary today TOO!!! Ditto on Tania breakin' out a big ol' can of whoopass on Shura........aaaaaahhhhhhhh that scene ROCKED! I love when Tatiana turns his double standards back on him!!!!! LOVE Tom Richter!!! Ohhhh, and I thought Alexander handled Tatiana keeping the truth from him about Sam, pretty well. He surprised me. I LOVE the whole thing with the bachelor party/hen party. Give it right back to him, Tania!! I was so happy when the HUAC tension was wrapped up and also had some major unresolved anger issues against Tatiana for making such a huge ordeal out of it! And I agree, Alexander did handle it surprisingly well all things considered - I think he truly understood her fear and mistrust about dealing with the government. And looking back at Alexander's friends, I think it's clear that the only "good guy" he ever dealt with in his life was probably Pasha - every other involvement had an ugly underside (dimitri, Ouspensky) so he naturally doesn't "get" that his new friends are scumbags. Tatiana just sees through them immediately but that almost makes it worse. And reading this part made me yearn to go back in time and buy a hundred acres of land for my family! How rad would that be!!! (but not so we could live there in a mobile home). I'm so happy that at least ONE decision has been a good one for them - they deserve it. ya know what though? That 4-3 vote was a weeeeeeeeee bit closer than I could handle...........I think I'd bolt, too. They had everything to lose. Everything. Uggh. 4-3. HAPPY 18th ANNIVERSARY, JENNIFER J!!! Bring on The Summer Garden! You Rock! Now Leave Me Alone!